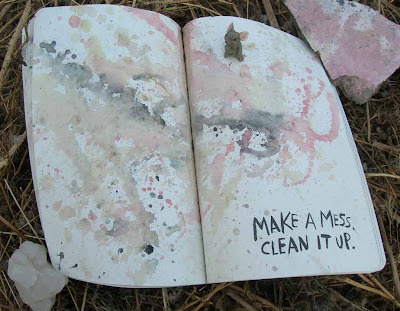 This post is part of my weekly exploration of the book "Wreck This Journal" by Keri Smith. I belong to a group of creative bloggers called "The Next Chapter" and we're all blogging together. Everyone is welcome to join us and blog along at any time. In Wreckage We Unite! Unfortunately I didn't listen to Jamie's video (she is our fearless leader and the founder of The Next Chapter book club) on last week's post so I didn't realize we were supposed to be picking an exercise in the book that scared us the most! Instead, I just randomly flipped to some pages and wrecked away! Taking time to be a part of this group and 'wrecking a journal' may seem silly at first but play can actually be a sacred activity and you can feel it in your body. Silly play feels good; it feels free and delightful and happy. I also feel at peace with myself while playing as if I've just nourished a little patch of my soul... and I have! To read more about 'the spirit of deep play' I recommend a book written by Diane Ackerman called "Deep Play." I was inspired many years ago by the late Candy Jernigan (she passed away in 1991 at the age of 39). She was an avant garde artist in New York City who was committed to documenting "any and all physical 'proof' that I had been there." She filled her journals with traces of food she'd eaten, old bottle caps, leaves, dirt, found litter etc. She had a compulsive desire to collect and document. 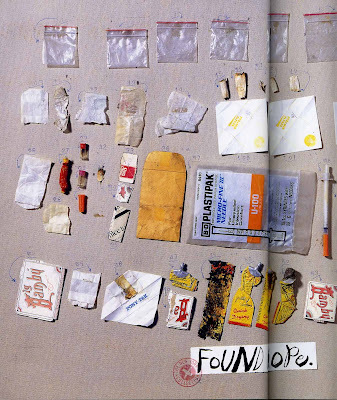 One of her more memorable collections called "Found Dope" consisted of crack vials found over a 16 day period near her New York apartment and arranged in exquisite detail - see image to the left - it comes from the book "Evidence - The Art of Candy Jernigan." You can follow along with Week 3 of the Next Chapter here.